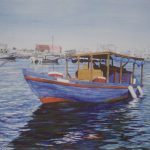 Malcolm Rae is a self-taught Artist who has been painting professionally for 15 years, realist tropical images, The Bahamas – in all its beauty. However, lately his style has evolved into an abstract realism, still bright and full of the sun. “Although born in England, I have lived in the Caribbean for Fifty years. I attended the University of the West Indies, Mona Campus, Jamaica, where I studied medicine. I have dissected two cadavers, which has helped with my people paintings. “I have been published in numerous magazine newspaper articles in The Bahamas and International Artist Magazine, Volume 25, Australia. “My works are in both international collections and local groups Bacardi. Governor of The Bahamas Sir Orville Turnquest. Vincent D’Aguilar Dawn Davies. I am the Ambassador for The Bahamas to the Portrait Society of America. I have a collection of Caribbean paintings from Trinidad, Haiti, Cuba, the USA and The Bahamas.